In this Aug. 12, 2018, photo, Afghan security personnel patrol in the city of Ghazni province west of Kabul, Afghanistan. A year after the Trump administration introduced its strategy for Afghanistan, the Taliban are asserting themselves on the battlefield even as U.S. officials talk up hopes for peace. That's raising questions about the viability of the American game plan for ending a war that began when some of the current U.S. troops were in diapers. A Taliban assault on Ghazni, a key city linking areas of Taliban influence barely 75 miles from Kabul, has killed about 100 Afghan security forces and 20 civilians since Friday, the Afghan Defense Ministry said. That has demonstrated the militants' ability to attack, if not hold, a strategic center on the nation's main highway, and highlighted the vulnerability of Afghan security forces. Against that turbulent backdrop, some wonder whether President Donald Trump can resist pulling the plug on a war in which the U.S. is still spending $4 billion-plus a year just to keep Afghan forces afloat. He said when he introduced his strategy on Aug. 21, 2017, that his instinct was to withdraw entirely. 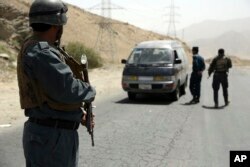 Fighting across the country has intensified in recent weeks despite a fleeting outbreak of peace earlier in the summer. Taliban and the Afghan government called separate, briefly overlapping, national cease fires in June, and the administration has made its own contact with the Taliban in hopes of nudging them into talks with Kabul. The strategy revisits an approach that was tried, and failed, under President Barack Obama: increasing military pressure to push the Taliban into peace negotiations with the Afghan government. Signs point to Trump pressing ahead; he is about to send a new Army general, Scott Miller, to take charge of the U.S.-led coalition in Kabul. David Sedney, who has worked on Afghan issues as a civilian, including multiple years in Kabul and at the Pentagon, since the war began in October 2001, said he believes the chances for peace are the best they’ve been. Among the meaningful factors at play, Sedney says, is Trump’s announcement a year ago that the U.S. would no longer set time limits on its military support for Afghanistan. This introduced an element of uncertainty for the Taliban, he said. On the other hand, the current U.S. push to draw Taliban leaders into peace negotiations with Kabul must succeed soon, he said, or risk following the failed path of previous efforts. Trump also gave the U.S. military more leeway to attack the Taliban, and a few thousand additional U.S. troops were sent to Afghanistan this year as part of an effort to improve the effectiveness of training and advising Afghan ground forces, while also developing a small Afghan air force. The battlefield results have been mixed, however, as the Taliban have managed to preserve their influence in numerous districts. Early in 2018 the U.S. military declared Afghanistan to be its top combat priority, supplanting the fight against the Islamic State group in Iraq and Syria. 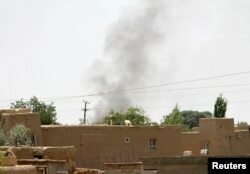 Key U.S. warplanes, including A-10 ground attack aircraft, were switched to Afghanistan, and the Pentagon introduced a newly formed outfit called a Security Force Assistance Brigade of U.S. soldiers assigned to help Afghan forces closer to the battlefield. With Ghazni under threat, the U.S. has dispatched military advisers to assist the Afghan forces in retaking the besieged city, and has launched airstrikes. Seth Jones, a longtime watcher of Afghanistan and director of the Transnational Threats Project at the Center for Strategic and International Studies, said it was unlikely the Taliban will be able to hold populated areas of Ghazni for long. The militants have lacked sufficient popular support and military power to hold population centers. But the Taliban’s ability to mass forces in multiple areas of Afghanistan at virtually the same time —including in Ghazni, Faryab, Baghlan, and Kunduz provinces — should worry Afghan and U.S. officials. Tribal leaders and local officials had been repeatedly warning Afghan policymakers in Kabul that the Taliban was preparing for a broad offensive in Ghazni, Jones said. He remains skeptical the U.S. strategy in Afghanistan will work as he sees no sign that Trump is willing to take what could be a game-changing move: to target the top Taliban leaders in their Pakistan sanctuaries. Afghan police officers search a vehicle at a checkpoint on the Ghazni highway, in Maidan Shar, west of Kabul, Afghanistan, Aug. 13, 2018. “Much like Bush and Obama, the Trump administration has other areas of the world that it would rather focus on, whether it’s the Korean Peninsula or Iran or China more broadly, and to move on, if possible, from Afghanistan,” Jones said. “If a settlement is the way to do that, then they are willing to give that a shot. The challenge, though, is that it is still not clear to me that the Taliban is seriously interested in peace negotiations” in terms that would be acceptable to the U.S. and the Afghan governments, including making a formal, public break with al-Qaida. The group has growing regional clout. The Taliban assault on Ghazni began as the head of its political office was wrapping up a rare diplomatic foray in neighboring Uzbekistan. Defense Secretary Jim Mattis, who helped persuade Trump last summer not to quit Afghanistan, says it’s too early to render judgment on whether peace talks will emerge anytime soon.